How Many Of You Will I See Next Week? I published this post just before boarding the long and uncomfortable flight to Pennsylvania, but that is a trivial introduction to a great week. 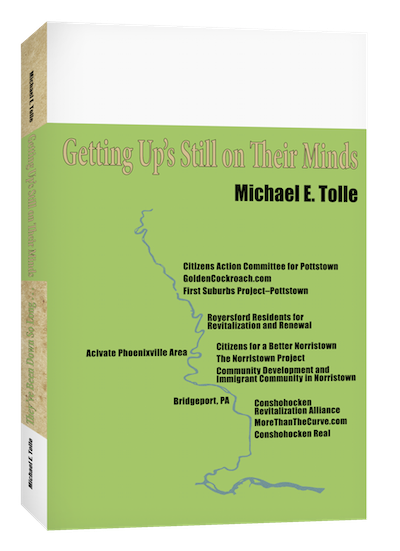 I will spend next week in the towns along the lower Schuylkill River, speaking about my new book, They’ve Been Down So Long…/Getting Up’s Still On Their Minds (and explaining the reason for that unusual title structure) as well as meeting with local activists on an informal basis. 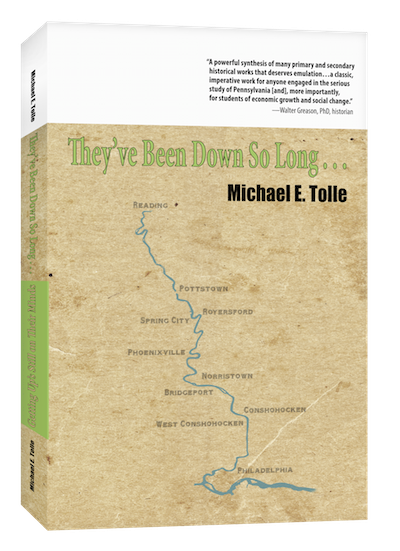 My work offers a read-at-your-leisure course in “Local History 101,” focused on the eight towns between the cities of Reading and Philadelphia on the lower Schuylkill River. Be aware: it is formatted in the old-fashioned Basic Organization Of Knowledge (“BOOK”) style, although a Kindle version will soon be available. The advantage to this format is that you get the lectures, class discussion as well as the assigned reading, all between the same two covers. The “book” format is—and the ebook will be—available from Amasquash, er, Amazon.com, of course. Locally, they will be sold at Towne Book Center along Rt. 422 at Rt. 29 and the Historical Society of Montgomery County on DeKalb Street in Norristown. I have addressed my book directly to the activists in each town, those seeking a better environment for themselves, their families and their friends. I discuss what I consider to be the three fundamental realities of life along the river. The first of these is the river itself; all eight communities are “river towns,” and the river’s enormous improvement in recent years points the way to a different way of utilizing it. But the river has always been only one of the fundamental realities around which life in its small towns has always been lived. My work examines the others also and how changes in them have spurred both high and low points in the history of all eight towns. The central point is that even the fundamental realities change, and the significance of those changes—and they have been great—must be grasped if you want to plan for a better future. History must be understood, not just remembered, if it is to be of any real use to our future. 220 Plaza Drive, Suite B-3, Collegeville Pa. Note that I made a special point to include local Rotary Clubs in my audiences. They may not make the headlines and you won’t see too many of them in the street holding signs, but members of Rotary are community activists in the most fundamental sense of the word. They are the men and women of local business, around whom and which urban revivals must be built. For those of you who take “community activism” more directly, I strongly urge you to attend what I have termed “Calling All Schuylkill Valley Activists” in Norristown, on Saturday, August 1, at 5 PM. Our hosts are Aleks and Joel of Coffee Talk, a much-too-neglected community treasure at 507 West Marshall Street. I frequently advocate inter-community communication and support, and this is an opportunity for you to discover that there are indeed others who think like you do and share the same concerns, just not about your immediate neighborhood. 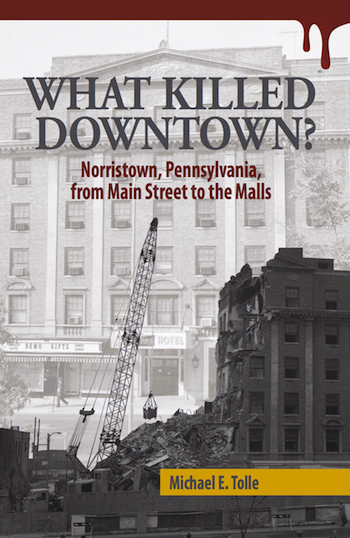 If you are coming in from out of town and think of Main Street when someone mentions "Norristown," give yourself some extra time to walk around the four blocks of West Marshall Street where the event will take place and see what a local commercial revival today might look like. There is one underway. There will be much to share when we gather together. I look forward to seeing you there, or at any of the other get-togethers on my list. Last week I posted a (very) theoretical proposal that I believe would make Bridgeport like Conshohocken. I predicted that “property values will rise, new housing will be built, new residents will settle in town, and if things work out well, maybe even an office building or two.” I then asked: “What’s not to like?” What I didn’t ask was the most fundamental question: why would anyone want to emulate Conshohocken in the first place? That’s this week’s topic. A quick review: the idea was little more than history repositioned for the automobile age. Its centerpiece was a new Ford Street bridge, with an improved Ford Street south to DeKalb Pike, a vehicle connection to the new Lafayette Street and a foot/bicycle path to the Schuylkill River Trail. Together they represent merely upgrades to what used to be before, substituting the automobile (and truck) for the railroad, and upgrading the roads proportionately. Remember, it’s a regional transportation proposal, because nobody is going to invest millions of dollars to revitalize just Bridgeport. Wait a minute. Am I not the person who wrote not so long ago that “history offers almost no guide for the present or the future”? Yes, that was I, on October 24, 2014, to be precise. I have since followed that up with more than one discussion about why this is so. It’s because fundamentally important things have changed, and greatly. Transportation is one of them. In the old days, “access to transportation” meant accommodating the railroad (or perhaps its lighter cousin). Over the course of the 19th century, access to rail transportation transformed the towns on the lower Schuylkill River into bustling, prosperous communities. Accommodating a rail connection underpinned a community’s growth and development. But today “access to transportation” means accommodating the automobile, and the automobile only destroys communities. Any regional transportation connection such as I have outlined would affect the surrounding areas in an economically positive way, but what about the impact on its host, the Borough of Bridgeport? Financially, it would also be a net positive for the borough, particularly if a business or two were to relocate to take advantage of the new connection. That would mean greater tax revenue, and Bridgeport could certainly use more of that. I should note at this point that Conshohocken is one of two river town building a new government/police administration building, with rather more state-of-the-art communications than nearby towns possess. The influx of business and people—but primarily business—is funding that. Never underestimate the positive impact of money on at least some community institutions. Housing values would also rise. Just look again at the Conshohockens. West Conshohocken, just down the road from Bridgeport, has been proclaimed the best place in Pennsylvania to buy a home, and Conshohocken, not much farther away, ranks sixth. You would have to go several places down the list before you come to Bridgeport. But I ask you, what do those rankings have to do with the boroughs themselves? The principal factors—Interstate highways and good school systems—would remain the same even if both borough entities ceased to exist. The fundamental question is this: the value of your house excepted, just why would you want Bridgeport to become like Conshohocken? A community is not measured by economic indicators alone. In fact, they don’t even count for very much. A better road connection to the Turnpike would transform Bridgeport, but with pretty much the opposite effect that the railroad had. The economic statistics will rise, and even might approach bustling, but the borough’s sense of community would likely wither and die. By this I mean that better road connections for Bridgeport would do pretty much what great road connections are doing for Conshohocken: greatly increasing property values while debasing its traditional strong sense of community. An upgraded Ford Street could be a positive boon to those arriving from north of the Schuylkill, and for King of Prussia to the south, but it would basically divide Bridgeport into two halves, one on each side of the street. Crossing between those two halves would be severely restricted in both location and duration, because the emphasis will be on moving cars along Ford Street, not people across it. Cars will still back up during rush hour, of course, so add traffic congestion to the daily mix. A similar process is happening in Conshohocken as we speak, dividing the borough between the new residences and offices along the floodplain from older parts of the borough up the hill. Once such a makeover is in place, expect more people come to live in Bridgeport, and maybe even some who come to work there. Those who come to work will leave for somewhere else in the evenings, and cannot be expected to contribute much to the new Bridgeport beyond revenue. But how about those who come to stay, the new residents? Will they contribute to a revival? First ask yourself the basic question: why will they move there in the first place? Probably not for work in Bridgeport. What investment will they feel—and make—in the community? In a town, with many people living so close together, shouldn’t “community” be a goal somewhere up there with making money? If you are going to live in close proximity to others, shouldn’t the word “community” take on greater value? I have been writing about my fear that Conshohocken’s reinvention, imposed on it from outside, will not be accompanied by a resurgence of the community pride that has always been Conshohocken’s trademark. I hope I’m wrong, but I don’t think I am. Bridgeport doesn’t have to be like Conshohocken, and if it avoids that fate we should all be pleased. The borough, having lost pretty much everything that once made it distinctive, at least has close to a clean slate with which to work. That has its downside, as repurposing beautiful old buildings can contribute greatly to a community’s revival, but you have to work with what you have. A new group is forming with revitalization its aim, and I applaud that. I (and others) may have advice to offer, but the plain truth is that the impetus for revival must come from within the Bridgeport community itself, not from outside. A part of that emphasis should be examining ideas that have worked elsewhere. On the lower Schuylkill, there are two models for reinvention: the Conshohockens and Phoenixville. The Conshohocken model is not the one to follow; Phoenixville is, and I will return to that subject in the near future. On May 29th, I wrote about a road project currently underway to connect Lafayette Street in Norristown to the Pennsylvania Turnpike, and how it represents a new opportunity to correct an old mistake. I also pointed out that a section of Plymouth Township and even Conshohocken could also benefit. So here’s my question: Why not add Bridgeport to those towns being helped? Okay, I think I already know the answer: money. But let’s just skip over that, and other, pesky details, and proceed with a proposal to remake Bridgeport, safe in the knowledge that no one is going to pay any attention to it. PennDOT will not follow up on this idea, because it is so obvious I am sure it has already been studied—and put on a very back burner—before. Thus what I am going to write about lies “in the realm of theory,” which is a polite way of saying “pipedream.” Of course, I don’t waste my time or yours with pipedreams, so this really isn’t about Bridgeport as it is about a much larger point, about “change,” a history subject near and dear to my heart. The major point about CHANGE: Whether change is good or bad depends on your relationship to what is being changed. Therefore, ALL change is both good and bad; it just depends on whether your ox is being fed or gored. We call it progress, but that’s a net judgment. We just forget about the losers that change created. The automobile revolution brought about a change in transportation that everyone refers to as “progress,” but I’ll bet that wheelwrights and buggy whip manufacturers were not pleased. What does this have to do with Bridgeport? Let me explain. If you want to change a Bridgeport into a Conshohocken, focus on ACCESS TO TRANSPORTATION. Conshohocken possesses quite close connections to two major, limited access highways, and that is why it is thriving. Bridgeport has U.S. Rt. 202 (and not really that, as Rt. 202 follows the Dannehower Bridge over, not through, the borough). When the current project is completed, Lafayette Street will offer both Norristown and a section of Plymouth Township what looks like quick access to the Turnpike. Conshohocken could benefit also, as the project basically offers borough residents an alternative to the Matsonford bridge and road route to the Turnpike (I have heard that there is some congestion along that route at certain times of the day). In order to benefit Bridgeport, an exit off Lafayette Street needs to be constructed, along with a new Ford Street Bridge. Please understand that I possess absolutely no qualifications to design anything like I am writing about. Then again, if I keep to generalities and avoid those pesky details, I can at least offer a proposal, because I have a secret resource. It’s called “history.” What I will describe is really little more than history recreated. The basic idea is to rebuild a route that existed back in colonial times, managed to survive into the 20th century, then closed down. Bridgeport basically began at a shallow section of the Schuylkill River known as “Swedes Ford.” The ford allowed people, animals and wagons to cross the river, at least most of the time. Swedesford Road headed south from this crossing. Early Bridgeport developed from this site until the DeKalb Street Bridge opened in 1824. That reoriented Bridgeport to the west, and the ford fell into disuse. A railroad bridge was built at the old ford in 1848, one that allowed people to walk across. It burned down in 1883, as a replacement bridge did again in 1924, just after the DeKalb Street Bridge itself burned. New bridges were built at both locations. The new Ford Street Bridge carried vehicular traffic as well as pedestrians. It remained a “private” bridge, and still charged people to cross, earning it the nickname of “the penny bridge”. It deteriorated from lack of maintenance and was finally torn down in 1939. I am not talking about just a new bridge. That would only connect Bridgeport to the new road, and that is not going to be enough. Imagine making a pitch to the Pennsylvania Department of Transportation that goes something like the following: “We’d like you to spend millions of dollars to build a bridge that connects the Turnpike to a stagnant river town of about 4,500 people.” Good luck with that. If you only focus on Bridgeport, the best you will get is polite nods, providing you can get a meeting in the first place. You need to think larger, and employ a phrase like “regional transportation solution.” That type of thing is easy to get behind. You definitely want to trumpet the opportunity to revitalize an old town, but as a side benefit, another reason to undertake the project, but not the major one. The key here is actually simple (if you ignore the details): rebuild Ford Street in Bridgeport from the new bridge to its intersection with Rt. 202. You can’t just dump people off a bridge onto Bridgeport’s streets as they now exist. By upgrading Ford Street you create a connection to King of Prussia. With the traffic congestion around the Expressway/Turnpike intersection, I believe many people in western King of Prussia would see the new route as an easier way to the Turnpike. That makes this a “regional transportation solution.” In that vein, and in search of another constituency, let's add a protected bike lane on both Ford Street and the bridge, with a direct connection to the Schuylkill River Trail. That can't hurt. Once this project is completed, property values near it will begin to rise, the large new project already proposed by Brian O’Neill could get a new life, and other developers will begin to look at the area. This new connection will not rival Conshohocken’s, and thus the development that follows will certainly be less. For a town the size of Bridgeport, that makes sense. The change may not be as large, but it is likely to be as fundamental as that taking place in the Conshohockens right now. So, property values will rise, new housing will be built, new residents will settle in town, and if things work out well, maybe even an office building or two. What’s not to like? Remember what I said above about CHANGE; some bad always accompanies the good, and this concept is no exception. I will break my every-two week posting cycle to write about the other side to this idea next week, because there definitely is one, and it should be considered.